Also known as the “Michael Liebel House,” is the childhood home of Michael Liebel Jr. This Colonial Revival style home was built in 1882 by the German immigrant Michael Liebel Sr. Liebel’s son Michael Liebel Jr. was born on December 12, 1870 and died on August 8, 1927. Liebel received his early education in the public and parochial schools of Erie. He attended Canisius College in Buffalo, New York until 1887 when he was employed as an accountant in the Buffalo office of the New York, Chicago, and St. Louis Railroad (Nickel Plate Road) for five years. After returning to Erie he was employed in the office of Jackson Koehler, owner of the Eagle Brewery. He was a lifelong member of the Catholic Church and belonged to the Elks, Eagles, and Moose lodges. In September of 1906, Liebel Jr. was appointed Mayor of Erie to fill a vacancy caused by the death of Mayor Robert J. Saltsman. He served as mayor until 1911 and was then elected to Congress from the 25th district from March 4, 1915 to March 4, 1917. 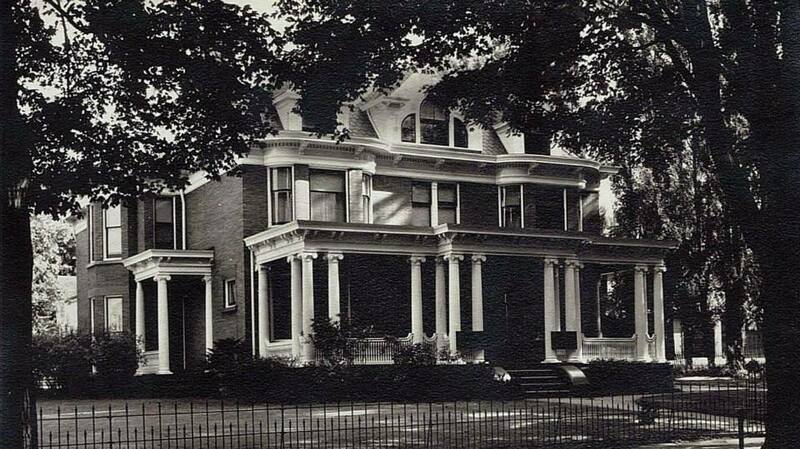 The Michael Liebel House was used for many years as the Merle E. Wood Funeral Home until 1992. It currently functions as a nursing home for the Village at Lutheran Square and remains an important contributing structure to the West 21st Street National Historic District. Description: Built in 1882, the Michael Leibel House is a sprawling 8,198 square feet, impressive Colonial Revival home that reflects the national interest of the late-nineteenth century in early English and Dutch architectural styles. Colonial Revival is characterized in part by its accentuated front door, normally with decorative crown supported by pilasters, or extended forward and supported by slender columns to form an entry porch. The Liebel Home is constructed of buff colored brick and Corinthian styled columns. Three pedimented dormers decorate the roof. The roof is accented with a cornice that also matches the porch roof. The building now has a three-car garage attached to the rear to accommodate for its use as a funeral home.